Fragile - Why we feel more anxious and overwhelmed than ever? Stella O’Malley is a mental health professional, bestselling author, and public speaker. Much of Stella’s counselling and writing focuses on mental health and the importance of well-being and she is a regular contributor to the Irish Independent, the Sunday Independent, Newstalk FM and Today FM. Stella's first bestselling book, ‘Cotton Wool Kids’, was released in 2015 while 'Bully-Proof Kids: Practical tools to help kids grow up confident, resilient and strong' was released in 2017. In 2018, Stella was the presenter of the highly-acclaimed Channel 4 documentary ‘Trans - Kids: It’s Time To Talk’. Stella’s new book ‘Fragile': Why are we feeling more anxious and overwhelmed than ever before’, which focuses on overcoming anxiety and stress was released by Gill Books on April 5 2019. ‘Fragile’: Why We Feel More Anxious, Stressed and Overwhelmed than ever? Out in early April, my new book moves beyond parenting books to general self-help and explores the reasons why so many people feel more anxious, overwhelmed and stressed than ever. The way that we are encouraged to emphasise our emotions, often causing more harm than good, and how we are misreading mental health messages is also scrutinised. With a particular interest in the rising levels of anxiety, she shows us how our increasingly perfectionist and materialistic society has created a society shallow and toxic that is high on expectation and low on satisfaction. After examining why and how we feel so overwhelmed and anxious, the second half of the book focuses on tapping into our inner strength so that we can learn to stop giving our power away. More than anything, this book, with a series of simple thinking tools, helps the reader to move forward to a place where they can experience challenges to their mental health and yet feel adequately empowered to address their issues. When you’re a child, tween or teen, the social scene can be difficult to handle. Some kids haven’t yet developed the social skills to be able to cope confidently in this toxic world where bullies won’t let up, worried victims are ashamed to tell and bystanders don t act to help the situation. 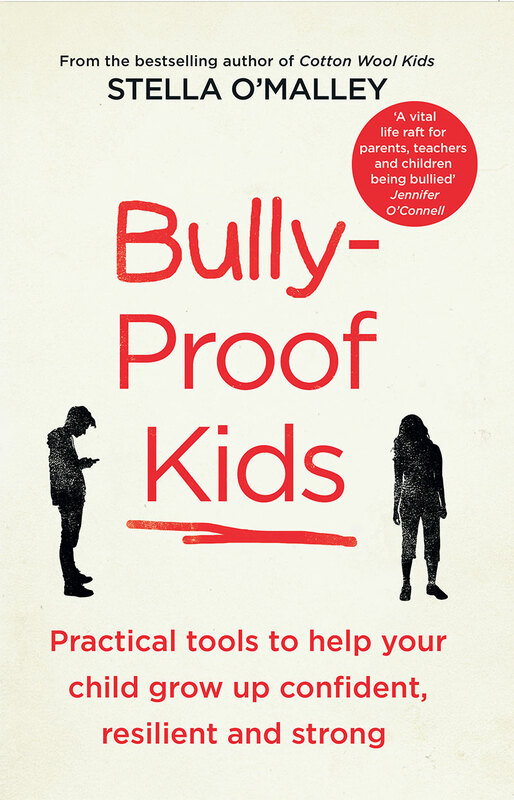 'Bully-Proof Kids' gives parents – and kids – the tools to break the cycle by examining the factors that contribute to bullying: the school environment; the personalities of those involved; and the often-overlooked role of bystanders. In this new book, Stella describes what determines whether your child may become a victim, a bystander or a bully and offers concrete strategies to help you empower your children to be socially competent and deal with bullying both online and in school. 'Cotton Wool Kids' exposes the truth behind the scary stories and gives parents the information and the confidence to free themselves from the treadmill of after-school activities and over-supervision that has become common today. Parents are provided with strategies to learn how to handle the relentless pressure from society and the media to provide a 'perfect' childhood, and instead to raise their children with a more relaxed and joyful approach. This highly acclaimed book reveals the media-fuelled madness of paranoid parenting and describes how a more relaxed attitude to raising children can lead to happier, healthier families. In this 'Laura Meets.. series for the M Word, I chat to Laura Wood to discuss stress in childhood - and who's responsible? The conclusion may surprise you. In the first of ' Laura Meets...' series for The M Word, I met child author Laura Wood where we took on the topic 'Should We Allow Our Children To Take More Risks? 'All the questions came from the M Word readers!